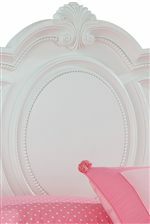 Accent your youth's bedroom with the Jessica Mirror, full of pretty details to visually please. 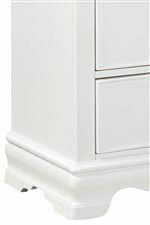 It is crafted from solid hardwood and quality wood products with a clean paint finish. Featuring beaded pearl trim and beautiful floral ornaments, it is a truly charming addition to any space. Oval in shape, a crown with shell carving adds an impressive touch. Pair with the Jessica Dresser for a classic duo. 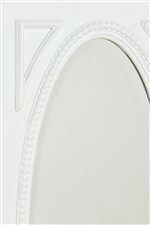 The Jessica Decorative Oval Shaped Mirror by Standard Furniture at Standard Furniture in the Birmingham, Huntsville, Hoover, Decatur, Alabaster, Bessemer, AL area. Product availability may vary. Contact us for the most current availability on this product. The Jessica collection is a great option if you are looking for Traditional furniture in the Birmingham, Huntsville, Hoover, Decatur, Alabaster, Bessemer, AL area. Browse other items in the Jessica collection from Standard Furniture in the Birmingham, Huntsville, Hoover, Decatur, Alabaster, Bessemer, AL area.